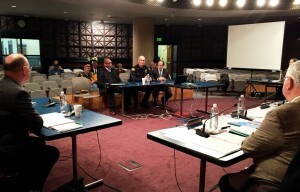 New Transit Police Commander Mike Leloff (center, in uniform) addresses the TriMet Board of Directors on Jan. 28, 2015. Growing up, Leloff was a small town boy with aspirations of being a cop. Now this Pacific Northwest native is taking over the helm of Transit Police. He says he’s excited to lead efforts to keep the transit system safe and secure while moving a small city, but one much larger than his own childhood town of Clatskanie, Oregon, each day. TriMet and its Transit Police Division use community policing to reduce and discourage crime on the transit system, which in part led to a 25 percent drop in reported crime on the system in 2013. Leloff, a 30-year police veteran, likes the community policing model and wants to take it a step further, not just having his officers connect with riders and the public, but collaborate with them on solving issues. “Let’s have a conversation about what is really happening on the system, in neighborhoods, and the wider community and then be part of the solution,” Leloff said. Leloff says TriMet is a leader in the transit industry and he believes the skills he brings to Transit Police will help increase relationships with fellow police agencies, community groups and the public. Connectivity is a priority, “I want to bring people together,” said Leloff. Prior to Transit Police, Leloff served as commander of the Portland Police Bureau’s North Precinct. He has also been captain of the Tactical Operations, Strategic Services and Drugs and Vice divisions, and has worked on the Gang Enforcement Team, Metro Gang Task Force and Alternate Special Emergency Reaction Team (SERT). Prior to Portland Police Bureau, Leloff worked at Cornelius Police and Tualatin Police departments. Leloff is married to his wife of nearly 22 years, Conni. They have two daughters, 17-year-old Courtney and 14- year old Megan. The Leloff family enjoys the outdoors, including camping and fishing. Right now, however, it’s basketball season so in his off-time, Leloff is at the gym cheering on his girls. Former Transit Police Commander Kevin Modica will continue to be involved with Transit Police. Modica was recently promoted to Assistant Chief, heading a new Community Services branch of the Portland Police Bureau. The Community Services branch includes the Transit Police Division, Traffic Division, Youth Services Division and others. Modica served as Transit Police Commander from June 2013 to January 8, 2015.